Visually beautiful movie with not-complicated plot and strong message mankind still ignores. "They killed their Mother." It is awesome! I watched it 3 times! Awesome movie, watched it 5 times! This movie broke new ground in visual effects..they were simply stunning.Storyline was good,had some morals.Makes more than a few points about what man is doing to our planet.Definitely see it ! look people, just because a movie has special effects does not make it the greatest movie of all time. the dark knight was amazing and it had little special effects. i agree that the plot was a little predictable and this story has been done before. ice age for example. plus it drags on and is way too long. nice action, but the acting could have been better. bottom line special effects aren't everything. A little long, but incredible. A well done film done by James Cameron. 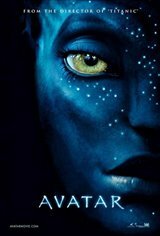 Who ever rated it less than 3 stars you are wrong it has great graphics and awesome colour like the AVATARS are blue,and its all because of AVATAR my cousin started painting him self blue and acting like an avatar (btw my cousin is 10.) So who ever did`t see avatar yet i bet you a thousand dollars that you would love the movie.Exellent preformance done my Michelle Rodriguez and Zoe Saldana. Trust me YOU WILL LOVE IT. I'm really torn with this movie theres things I like and don't like I like the special effects and the beautiful scenery but the storyline is way too predictable and if you've ever seen jaws you know that its not the cgi that makes a movie spectacular. A movie that is like no other! A movie that revolutionized the history of American film industry! pure chick flick...totaly gray. minus the r! Best graphics ever, special effects and colour that I have ever seen. Because of way advertised no desire to see it. Have no real clue to story line since they never really showed it. If I could rate it higher than 5 star I would. Left you just speechless (3D). This is a masterpiece, must see. I just didn't get the whole Avatar craze. Movie was okay but not even close to the best movie I have ever seen. You can't base a movie just because it has good effects that it is a great movie. I found the movie at times to be boring and predictable. This movie never gets old. I'm so buying the DVD when it comes out. There is only one word to describe this movie,AMAZING!! Horrible movie, atrocious script, rainbow colored version of earth with mountains that got their foundations cut. Great Movie. Pandora is a beautiful place definitely worth seeing in 3D (more than once). Visually stunning with an above average storyline. Worth every dollar. Highly Recommend 3D.